Modern computer architectures share physical resources between different programs in order to increase area-, energy-, and cost-efficiency. Unfortunately, sharing often gives rise to side channels that can be exploited for extracting or transmitting sensitive information. We currently lack techniques for systematic reasoning about this interplay between security and efficiency. In particular, there is no established way for quantifying security properties of shared caches. 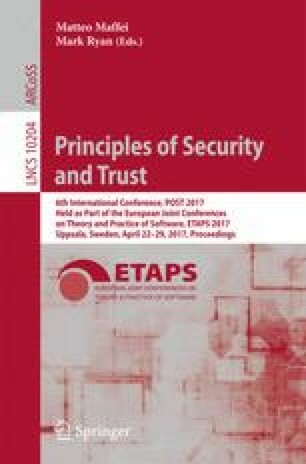 In this paper, we propose a novel model that enables us to characterize important security properties of caches. Our model encompasses two aspects: (1) The amount of information that can be absorbed by a cache, and (2) the amount of information that can effectively be extracted from the cache by an adversary. We use our model to compute both quantities for common cache replacement policies (FIFO, LRU, and PLRU) and to compare their isolation properties. We further show how our model for information extraction leads to an algorithm that can be used to improve the bounds delivered by the CacheAudit static analyzer. We thank Pierre Ganty and the anonymous reviewers for their constructive feedback. This work was supported by Microsoft Research through its PhD Scholarship Programme, by Ramón y Cajal grant RYC-2014-16766, Spanish projects TIN2012-39391-C04-01 StrongSoft and TIN2015-70713-R DEDETIS, and Madrid regional project S2013/ICE-2731 N-GREENS, and by the German Research Council (DFG) as part of the Project PEP.